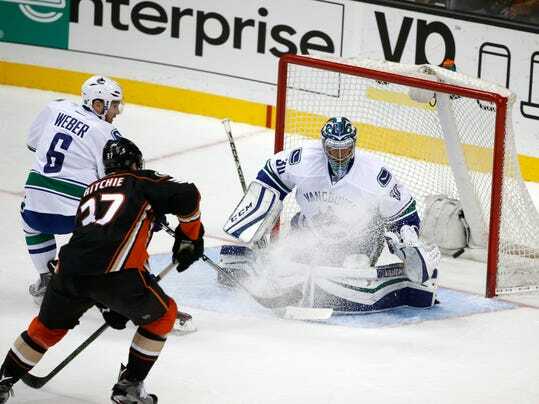 ANAHEIM, Calif. (AP) — John Gibson made 25 saves for his third career shutout to lead the Anaheim Ducks to a 4-0 win over the Vancouver Canucks on Monday night. Shawn Horcoff, Rickard Rakell, Jakob Silfverberg and Corey Perry scored and Anaheim won for only the second time in its last five games. 10 different Anaheim players had a point in its biggest rout of the season. Ryan Miller stopped 25 shots while Vancouver was shutout for the first time this season. Gibson made his NHL debut against Vancouver in the 2014 playoffs, stopping all 18 shots to eliminate the Canucks. Gibson nearly had another shutout last Friday against the Chicago Blackhawks, the other team he has blanked during his brief career, but blew a 2-0 lead in that one. Horcoff put Anaheim ahead just 1:19 into the opening period, taking Andrew Cogliano’s pass and converting a one-timer.